Preheat the oven to 350 degrees F. Lightly spray two 8x4 inch loaf pans with non-stick spray and set aside. In a medium bowl, whisk together the pumpkin puree, yogurt, coconut oil, eggs and brown sugar until they are well combined and no lumps remain. Set aside. In large bowl, mix together the flours, baking soda, baking powder, salt, cinnamon, pumpkin pie spice and chocolate chips. Make a well in the center of the dry ingredients and pour the pumpkin mixture into it. Stir everything together until there are no more dry spots. This makes a very thick batter and takes a little longer to stir together then a typical quick bread batter does, so don’t be alarmed. It will still be moist and tender! Divide the batter between the two prepared loaf pans and smooth it out in the two pans. They will be filled about halfway. Bake for 60-70 minutes until a toothpick inserted into the center of the loaf comes out clean. The loaves do not rise much in the oven as it is a dense, moist pumpkin bread. Allow to cool in the pans for 10-15 minutes before turning out onto a wire rack to cool completely. 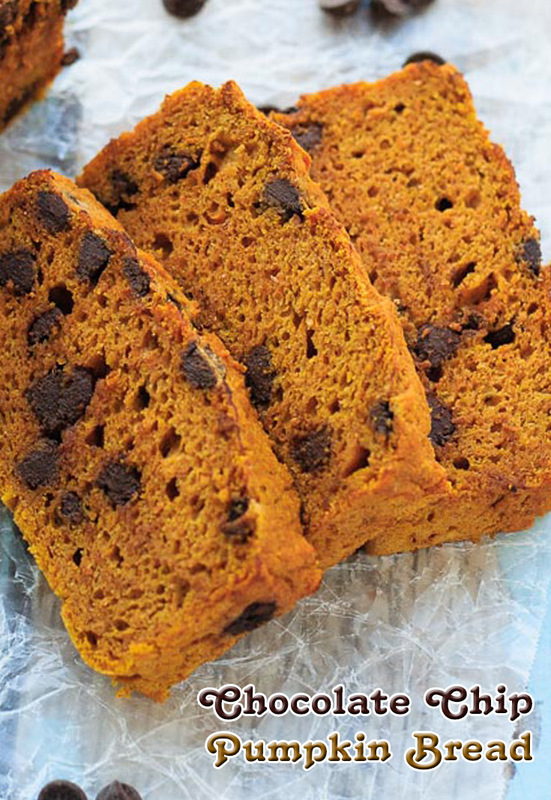 The pumpkin bread keeps well at room temperature, wrapped in plastic wrap or in an airtight container for 3-5 days, or can be frozen for up to 3 months.